Are you hoping to land a seasonal job as a cashier this summer? If so, you’ll want to create a resume and accompanying cover letter that are targeted specifically towards summer cashier positions. Here are some tips for tailoring your resume, as well as an example resume and cover letter you can use as models for your own. Your cover letter should include any previous customer service experience, along with examples of your leadership and communication skills. It's also a good idea to provide examples of difficult customers you've dealt with, and how things could have been handled differently. This shows potential employers that you have the wherewithal to access difficult situations and you're looking to grow as an employee and succeed, in any position. If you need help getting started, then the sample summer cashier cover letter provided below will serve as a useful guide. Also, see below for a cashier resume example. This is a cover letter example for a retail manager position. Download the cover letter template (compatible with Google Docs and Word Online) or see below for more examples. Please accept my attached application to work as a cashier at the Pink Creamery Ice Cream Shop. I know the Ice Cream Shop well and would welcome the opportunity to be an employee at your establishment. I believe my excellent customer service experience and leadership abilities make me an ideal candidate and I will work very hard to prove myself. Your advertisement posted on Craigslist specifies that you require an employee who is comfortable working in the customer service field. As a cashier at a local grocery store for three years, I have experience providing friendly service to customers even during the busiest hours of service, when patience runs thin. Also, as a member of my university’s entertainment committee, I have gained additional experience in customer service because I made arrangements and provided accommodations for a variety of artists and other performers. I always greet customers with a smile and I am eager to lend a helping hand when necessary. Finally, you state that employees must be leaders. I have proven my capability in this area because I have experience running the cash register alone for long periods of time. I have leadership experience in the academic area. I have experience managing meetings for my high school’s literary magazine where I serve as literary editor, and I have served as captain on my high school's track team. Both positions required me to make difficult decisions during stressful times. For example, when a team member was injured right before an important regional race, the track coach and I had to decide who would take her place. As a literary editor, I constantly have to make last-minute decisions about the organization of the magazine. I am confident that I can handle stressful situations and make important decisions while working as a cashier at your store. I am confident that my customer service abilities and leadership skills are just the qualities you are looking for at the Pink Creamery Ice Cream Shop. I have enclosed my resume and will call within the next week to see if we can arrange a mutually convenient time to meet. In the meantime, thank you for your time and consideration. This is an example of a resume for a summer cashier position. Download the cashier resume template (compatible with Google Docs and Word Online) or see below for more examples. Customer-oriented Cashier leveraging proven cash handling and communications skills to ensure top service provision to retail store clientele during the summer months. Communicate engagingly with customers from all walks of life, proactively defining individual needs and providing an upbeat and positive store experience. Excellent command of state-of-the-art scanning, automated point-of-sale, and telephone systems meticulously maintaining cash drawers to ensure adequate levels of cash and coinage. Concurrent with education, serve as Booking Assistant tasked with sourcing and securing talent for campus performances. Contact managers and arrange the performances of comedians, singers, and bands from across the country. Recently nominated and awarded title of Booking Assistant due to excellent organizational skills and ability to interact positively with managers and performers. Provided superb customer service and handled the payment transactions for hundreds of grocery store customers daily. 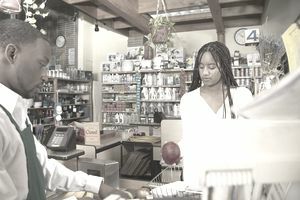 Greeted and checked out customers, handling cash, credit, and check transactions with 100% accuracy; utilized computerized point-of-sale system. Maintained and restocked inventory. Awarded “Employee of the Month” three times for excellent customer service and attention to detail.